Joe Cain: Who is he and why does he have a full day of parades in his honor? Mardi Gras was brought to Mobile by the French at 27 Mile Bluff in 1703. It’s safe to say, it wasn’t how we celebrate it today. I imagine it was just a service, food, and family. Today, Mardi Gras is weeks of parades and balls thrown by masked revelers. 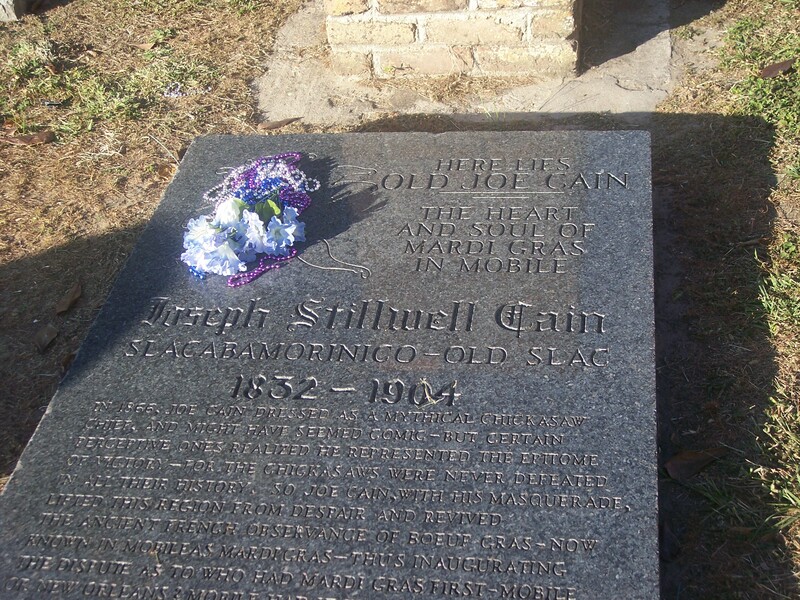 The modern Mardi Gras owes it’s life to a guy named Joe Cain. He even has a Mardi Gras day dedicated to him and his Merry Widows. Joe Cain Day is the Sunday before Fat Tuesday, Fat Tuesday is Mardi Gras Day and marks the end to festivities. Reality and myth have mixed and made it difficult to make out the real story. So here’s one version. Before the Civil War, the first Mystic society was born. Cowbellion de Rakin Society, consisted of Michael Krafft and his dinner companions taking to the streets with “borrowed” cowbells and garden implements. Hmmm, that’s a far cry from modern parades with a dozen or more beautiful floats. Each layer croweded with people in masks throwing treats at the crowd. This stopped during the Civil War. Joseph Stillwell Cain, in 1866, decided to revive Krafft’s parade. On Shrove Tuesday, he gathered some friends, “borrowed” a coal cart, and made simple costumes. In case you can’t tell from the photo, he’s supposed to be Chickasaw Indian chief Slacabamorinico. That is how the modern Mardi Gras started. Still a different monster than the beast that’s currently prowling downtown Mobile. I have no clue how a few guys dressed like indians parading in the streets turned into the Mardi Gras we have today, but I think Cain would be proud! Joe Cain Day is on February 15. You can catch his widows at the Church Street Graveyard weeping over his grave between 11:25-11:45. Trust me, if you’re in town, you want to see that! This entry was posted in chaos, research, Scene of the Crime and tagged Alabama, Joe Cain, Mardi Gras. Bookmark the permalink.